GREAT FINISH-LINE PARTY & RAFFLES! Hot food and cold beer waiting for you at the finish line, plus chances to win valuable prizes! Who says Florida is flat! 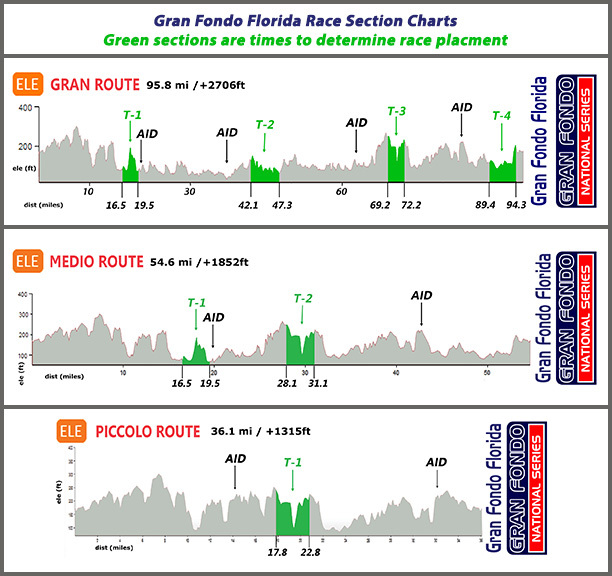 Centered in the rolling orange groves of Pasco & Hernando County, Gran Fondo Florida starts and ends on Pennsylvania Avenue in San Antonio, FL. The race follows, in part, the proposed Olympic road race course that was part of Tampa’s bid to host the Summer Olympic Games. It travels along rural rolling hills, past horse farms and crystal clear springs. Briefly going through Withlacoochee State Forest and the hills surrounding Brooksville, Florida. At the 89 mile mark you will enter a piece of US cycling history along Darby road, once home to the famous Darby Road Race that has seen the likes of Tour de France winner Laurent Fignon. This area is and has been the winter training site of some of the top triathletes in the world including members of the TIMEX team and the hometown of former US National Cycling team members Josh Thornton and Derek Wilkerson. To order this commemorative kit, click here! The routes will be very well marked, but we encourage you to get the RideWithGPS App and load the route to your smart phone or GPS. Use this RSVP LINK to access premium RideWithGPS features and get turn by turn navigation for free. A time bonus in the Gran Fondo will be awarded to EVERY TT participant. TT riders will be started on a “show-and-go” schedule. Meaning once a rider checks- in they can then proceed, when ready, to the TT start deck and will be cued for take-off. TT riders can get their timing chip near the TT start deck. Section 1 will be a ramp start. Section 2 will be a foot down start. We will do podiums for Overall-M/F Top 3 and Merckx-M/F. NO DRAFTING ALLOWED! This is an individual time trial. Time Sections: (THE COMPETITION) – This is not a start-to-finish race. Your overall time from start to finish does not matter for this competition. Only the timed segments count. Your overall, age group, and gender rankings are determined by your combined time for all timed segments on the route you choose. View Complete Rules and FAQ. Saturday, March 23, from 2:00 PM to 5:00 PM Vo2 Max Cycles 32807 Pennsylvania Ave, San Antonio, FL 33576. Sunday, March 24, from 6:00 AM to 7:15 AM Vo2 Max Cycles 32807 Pennsylvania Ave, San Antonio, FL 33576 (at location of race start). You must check-in in person and you must have ID to check in. We recommend picking up your packet on Saturday to avoid the rush on race morning. If you plan to pick up on Sunday morning before the race, don’t be afraid to be early, you are better off having some extra time, you will need it. Join us and get to know your fellow riders at Flint Creek Outfitters in Dade City from 6:30-7:30 PM on Saturday. Drinks and appetizers will be served. You can rent a bike from VO2 Max Cycles, our venue host. Contact Pierre at (352) 534-0888. All Timing Chips must be picked up on race morning. This is a very quick process that is separate from check-in, you will need to show your race bib number to get your chip. You can be dressed and ready to ride and swing by to get your chip. Race numbers must be mounted on your back right side and be easily readable. You must return your timing chip or you will be charged 100 dollars. Please make sure you return it! Event will start and finish on Pennsylvania Avenue in San Antonio, FL. You must start on time at 8:00 AM or your times will not be counted. Race briefing is at 7:45 on Pennsylvania Avenue in San Antonio, FL under the arch. Be there. $129 special rate. To get the special rate, call the hotel at 352-567-5277 and register under the group name Gran Fondo Florida..
No exceptions for 100 & 55 mile riders! If you do not maintain an average progression speed greater than 10mph you will be directed to take a shorter route. These cut-off spots will happen at the pre-established splits and you will be directed to the shorter route. Please Note: This is a 10mph progression speed, not average speed. Progression speed includes all stopped time. No exceptions! Fully searchable results will be posted on the Results page as soon as they are available. - Awards presented three deep for each category for fastest section times. 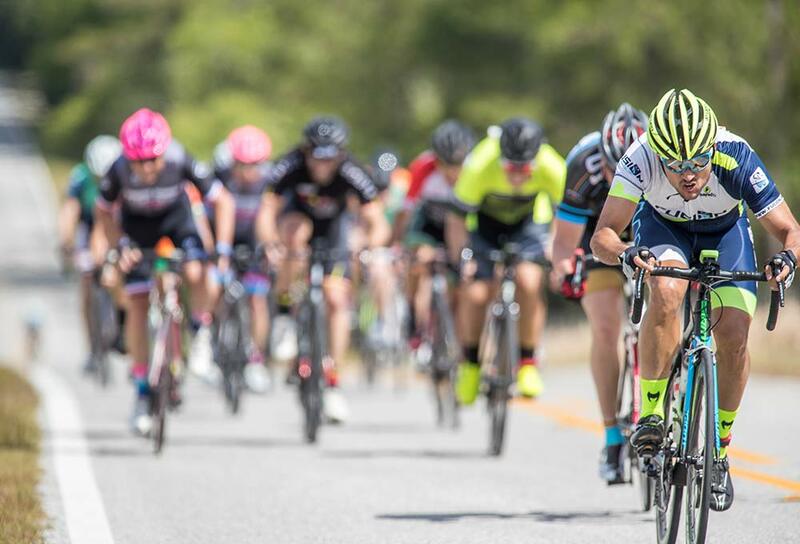 - Custom produced Gran Fondo Florida Winners kits will be awarded to the fastest riders in each age category of the Gran Route 100 mile event. These will be mailed to you post event in the size you order. - Time Section Primes – The fastest female in section 1 and in section 3, and the fastest male in section 2 and in section 4, and the will win a prize. As part of the worldwide Haute Route family of cycling events, GFNS is proud to deliver world-class service, as well as valuable incentives to join us at Haute Route 3-day and 7-day cycling events in the US and around the world. If you can finish a GFNS event, you are ready for Haute Route! To inspire you to do more, Haute Route will apply your full GFNS entry fee toward a 2019 Haute Route entry! If you ride any GFNS event in 2018, you are entitled to credit the entire entry fee paid toward any 2019 Haute Route three-day or seven-day event. Already signed up for the Haute Route? Then take advantage of a free entry into one 2019 GFNS event of your choice to prepare for the Haute Route. You Must Obey Traffic Laws. This is not a closed course. That means stop at lights and stop signs. Think Safety First.